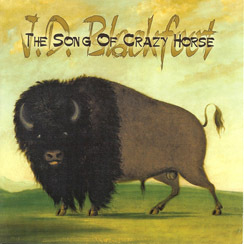 This 2007 CD re-release of “The Song of Crazy Horse” was remastered and this artwork replaces the artwork used on the 1992 CD release of this title, and this cover artwork more closely resembles the cover art used on the 1974 U.S. album cover. It also contains the 20 minute live version of “The Song Of Crazy Horse” taken from the ”Live in St. Louis – July 16th, 1982 ” album, as an added bonus track. This CD is packaged with an eight panel booklet with photos and history about this classic J.D. Blackfoot masterpiece. “The Song of Crazy Horse” was recorded in New Zealand on the Pye label in 1973 and won New Zealand’s Recorded Arts Talent Award (RATA) Album Of The Year award for 1974. The title track is a 19 minute saga about the life of the Oglala Sioux Chief Crazy Horse. It was released in 24 countries on the U.S.A. based Fantasy record label and in 1988 J.D. bought back all rights the the album as well as all of the the song copyrights. “The Song of Crazy Horse” is now re-released on J.D.’s own Yonder Music Group recording label, and to this day “The Song of Crazy Horse” is still captivating old and new listeners alike all over the world. J.D. also bought back the “Southbound and Gone” album and song copyrights from Fantasy in 1988 and that title may be re-released on the Yonder Music label in 2014. There are plans to re-release a vinyl version of ‘The Song of Crazy Horse” in 2014 as well. The album received spotlight picks in Billboard, Cashbox, and Record World magazines. History and English teachers often use “The Song of Crazy Horse” in their classroom when teaching about the American west and Native American history. Wherever radio stations were willing to play a 19 minute track, The Song of Crazy Horse instantly made the phone lines light up. In St. Louis, Missouri, KSHE FM has played “The Song of Crazy Horse”, in it’s entirety, on the KSHE Sunday Classics Show at least once a month, every month since 1974. Some 40 years and counting (as of 2014). Let’s discuss about how you can be sure that drugs you purchase through a mail-order pharmacy are foolproof. Antabuse treating alcoholism addiction in adults, as part of a recovery treatment program. Again it may also be used to solve other claim as determined by your pharmacist. Few drugs are used to treat failure to get an hard-on. Kamagra is a remedy used to treat varied upsets. What do you have to read about http://herballife.biz/levitra-online? Very likely every adult knows about Levitra Online. More information about Kamagra available at Buy Levitra online. Some men who drink excessively like cocaine find it tough to maintain an erection and turn to erectile dysfunction medications. So it’s substantial to know about the matter. While the therapy is credited with improving nausea, it may also kill the mood in bedroom. There are various medications to treat erectile malfunction. Do not order medications like Kamagra from an online pharmacy that offers to write prescriptions or that sells drugs without prescriptions.